Fill a large soup pot with 1-2 inches of water. If you have a steaming insert, add the insert and steam the green beans until they are just starting to get tender, around 4 minutes. Immediately shock the beans in ice water to stop the cooking process. If you don’t have a steamer, bring a full pot of water to a boil, add the green beans for about 45 seconds, and immediately shock in cold water for about 1 minute. After either cooking method, bring the beans out of the cold water and pat them dry with a paper towl so they stay crisp. Roughly chop the tomatoes into bite-sized pieces. 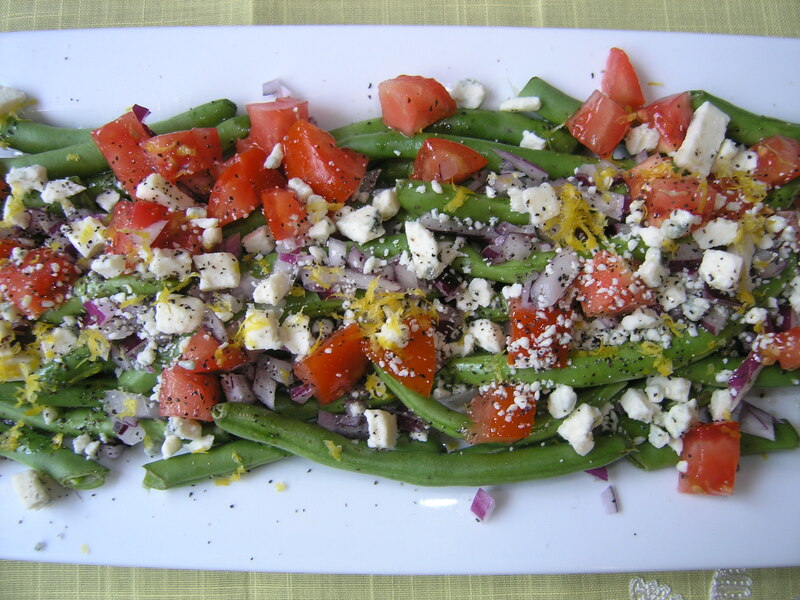 Toss the green beans, onion, bleu cheese, and tomatoes together in a large bowl. Place on a serving dish. Whisk together the remaining ingredients in a small bowl with some salt to taste. Drizzle over the vegetables. Add freshly cracked black pepper to serve. If preparing ahead of time, mix everything together, but taste to see if additional salt is needed- cold food needs more seasoning than warm food.